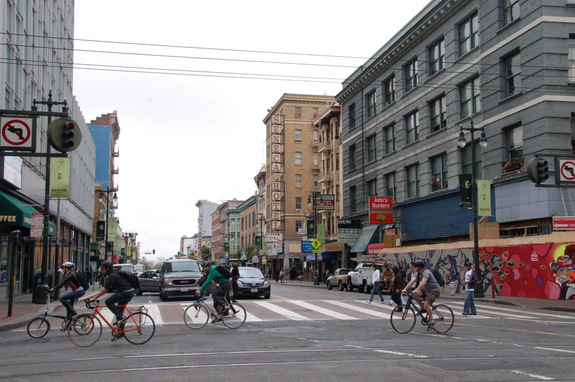 Sixth Street, which has one of the highest rates of pedestrian injuries in the city, could receive a road diet after the SFMTA analyzes the impacts of removing two of its four traffic lanes to improve safety. In the meantime, the agency is planning a pilot project this fall on the street’s northern end at Market Street, likely in the form of a parklet-style installation in the parking lanes, to test out “gateway” treatments to signal freeway-bound drivers to slow down. Though the SFMTA won’t present proposals for the pilot until the next community meeting in the coming months, planners said it will likely occupy parking spaces for roughly two months on one or both sides of Sixth between Market and Stevenson Street, an alleyway. Sallaberry said the pilot would help inform the larger plan to redesign Sixth for the long term. In addition to calming traffic, removing two of the street’s travel lanes will open up space for improvements like sidewalk expansions, bike lanes, and greenery. “This will help mitigate the impact of even more cars coming to the 6th Street area to park at the new mall, and help to invite more people to walk by making conditions more safe and comfortable,” she said. Planners said the project would not include any physical changes to reinforce the mandatory right turn for private autos from Market onto Sixth, which is violated by 70 percent of drivers, according to the SFMTA. Any such changes would fall under the purview of the Better Market Street project, they said. I’m curious what the selection process looked for the parklet vs. ideas the community offered last night including a large banner, sidewalk lights, closing the street altogether, speed enforcement, and mid-block crossings. There wasn’t a clear process indicating how the parklet would impact public safety or why it was being selected. A parklet at Sixth and Market? What could POSSIBLY go wrong? UN Plaza is so nice and inviting, after all! A parklet seems destined to become an unsavory mess in that location. Can’t sfmta create other place- making, traffic calming design measures that won’t turn into blighted spots? Sixth Street deserves attention and care, but the parklet is the wrong prescription. Not too many, but I have seen some interesting speed reduction humps (very gentle slope but effective) and narrowings in the Presidio. Seems to me 6 th St could use wider sidewalks and bike lanes while ditching much of its parking. Because of its direct connection to a freeway on+off ramp it seems like it will need a couple of traffic lanes in both directions, unless it’s made one-way.